We all can agree that planning for the financial well being of our families is certainly a subject we should give some serious thought to. And that’s the purpose of the following information – a serious though not complicated look at “the truth about life insurance” and why it’s important to you. 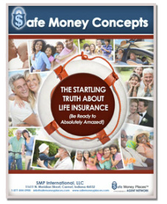 First of all, let’s get one simple truth out of the way right now … it’s not a pleasant thought, but it is a necessary one: Life insurance is about what a person is going to leave to his or her heirs after he or she dies (and that “what” means m-o-n-e-y). But, life insurance can be much more than that; in fact, life insurance can be a way to build up a personal fund that you may use yourself BEFORE you die. Buying life insurance can be very confusing because, today, you have so many choices. If you’ve ever thought about “What is the best type of life insurance to own,” the simple and best answer is “The type of life insurance that is in force on the day your heirs need it!” That may sound like some salesperson’s quick retort, but it is really The Truth! It should come as no surprise to you that “term” life insurance involves “time,” that it pays a death benefit to your heirs only if you (the insured) die during a specified period. Permanent Life Insurance provides you with coverage throughout your entire lifetime, and it may include a way for you to build “cash value" in your policy. Need help deciding which life insurance policy best fits your needs?